Affordable Professional LCD displays for 24/7 Digital Signage. 32″, 43″, 50″, 55″, 65″, 70″ & 86″ models. Built with commercial grade LCD panels and components these displays are designed to run 24/7 in constant use; unlike domestic TV screens and other professional monitors that are only designed to run for 16 hours a day. These LCD panels also has a lifespan of over 70,000 hours of continuous use – almost 8 years! At 450cd/m² the IPS panel shines brighter than any domestic television while delivering superior image quality and colour depth with a 178° ultra wide viewing angle in both landscape and portrait orientations. Domestic TV’s are not designed to operate in Portrait orientation. 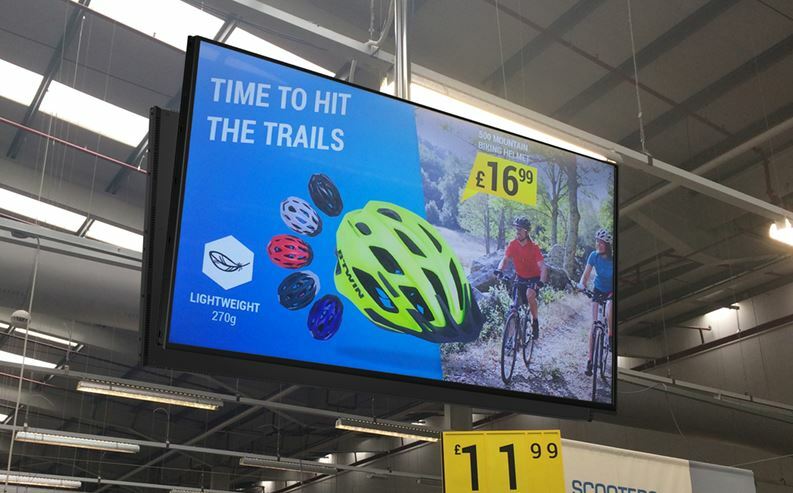 For digital posters you need a commercial display. Designed with a narrow bezel that helps draw attention to the on-screen image and not the physical display providing maximum impact messaging. Thanks to the narrow bezel these monitors can also be used side-by-side to form a budget friendly video wall solution. All screens have integrated slimline stereo speakers for applications that require an audio element. An eco-friendly power timer allows you to assign daily or weekly on and off times for your screen. The ability to power on and off automatically is unique to commercial displays. As the screen is only in use when it needs to be it saves you money in running costs. With LED backlights these displays offer improved brightness and contrast as well as drastically improving their lifespan and reducing their power consumption. Unlike older forms of lighting this technology is mercury free; making it even more eco-friendly. The internal air-cooling system allows the screens to be in constant use. A fan-less cooling system keeps the panels and other internal components at the optimum working temperature; ensuring a long and reliable life for your screens. The 86″ model benefits from UHD resolution for increased detail. Ideal for use in meeting or control rooms. Includes 3 year hardware warranty. – Excludes delivery, mounting solution and installation. Delivery charge subject to location and quantity. Mounting solutions starting at £15 per screen dependent on size. Flat, tilt and ceiling options available on request. Digital Menu and Customer information screens.